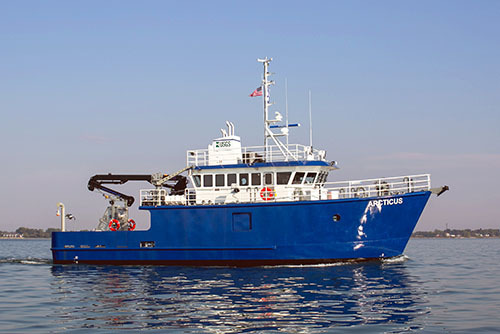 The U.S. Geological Survey (USGS) achieved a major milestone on August 31, 2015 when the Research Vessel (R/V) Arcticus was commissioned into service on the Great Lakes under command of the USGS Great Lakes Science Center. 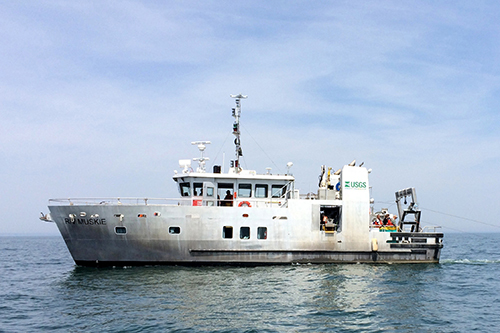 The historic event marked the final step toward modernizing the entire USGS Great Lakes research vessel fleet with five state-of-the-art floating laboratories. The fleet plays a crucial role in the sustainability of the Great Lakes fishery and the renowned recreation and tourism economy of the region. laboratory on the Great Lakes. The Great Lakes research vessel fleet supports multi-jurisdictional science for managing Great Lakes resources and plays a critical part in the decades-long partnership between the USGS and the Great Lakes Fishery Commission. For over fifty years, surveys conducted on the USGS fleet have provided unbiased scientific information about the status and trends of fish communities in the Great Lakes, particularly prey fish communities, as well as the ecosystem as a whole. This information is essential to the fisheries management process coordinated by the Commission via the Council of Lake Committees (CLC). The CLC brings together state, provincial, and tribal management authorities on each Great Lake to set management objectives, such as catch limits and stocking targets of sport species like salmon and lake trout. The information also informs native species restoration and invasive species research and control efforts by the Commission; USGS; multiple state, tribal, and federal agencies; and university partners. 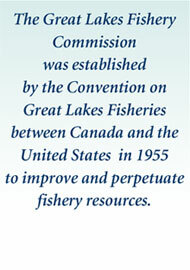 "The tight partnership between the USGS and the Commission links the intellectual resources of a world-class federal science agency directly to the fisheries management and the Commission's restoration regime that protects the Great Lakes basin's invaluable resources," said Robert Lambe, executive secretary. "The Great Lakes fishery is worth over $7 billion annually, and the fishery is sustainable in large part because management decisions are based on unbiased scientific information provided by the USGS and its research vessel fleet." 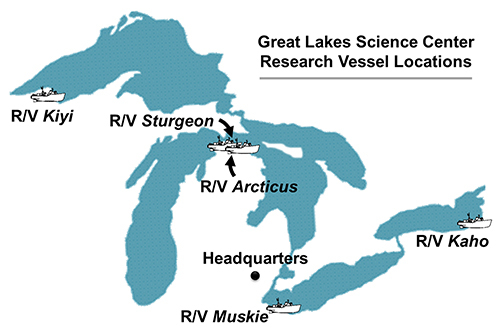 The vessel restoration process took only fifteen years to complete, with three new vessels built during the past five years alone: the R/V Arcticus (2014) which serves Lake Michigan and Lake Huron, and the twin vessels, the R/V Kaho (2011) which serves Lake Ontario and the R/V Muskie (2011) which serves Lake Erie. In the 1990s, the USGS acquired an older vessel which was renovated and christened the R/V Sturgeon in 2004, and is used on Lake Michigan and Lake Huron alongside the Arcticus. 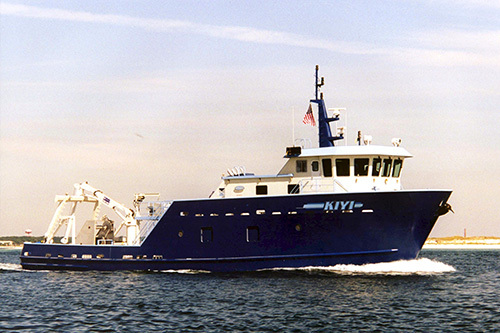 The largest vessel in the fleet, the R/V Kiyi, was built in 1999 and serves Lake Superior. "Building a research vessel fleet is a big undertaking," said Russell Strach, director of the USGS Great Lakes Science Center. "Deploying an adequate science platform is essential to providing the information needed to support healthy fish communities and ecosystem services that benefit the people of the United States, Canada, and Indian tribes. The modernization of the Great Lakes vessel fleet is an achievement that will benefit the Great Lakes region for many decades." The modernized fleet provides improved research capabilities, enhanced health and safety features, and increased fuel efficiency on versatile platforms built to serve a range of large-scale societal needs. All of the Great Lakes research vessels are state-of-the-art, "multi-platform" vessels, meaning scientists can deploy multiple sampling gears from a single vessel, including trawl nets, gill nets, plankton and larval fish nets, hydroacoustic sampling technology, water sampling gear, and technology that measures water chemistry. Learn more about the vessels by reading their profiles below. The USGS Great Lakes Science Center is headquartered in Ann Arbor, Michigan, and has biological stations and vessel bases located across the Great Lakes basin with research vessels on each of the Great Lakes. The datasets generated on board the vessels on prey fish abundances are foundational to a binational fishery management regime coordinated by the Great Lakes Fishery Commission that has ensured sustainable sport and commercial fisheries on the Great Lakes for a half-century. The R/V Arcticus, based in Cheboygan, Michigan, was built in 2014 and currently operates on Lake Michigan and Lake Huron. The Arcticus is used primarily to carry out annual prey fish assessments, which have occurred since the 1970s. The annual assessments provide current information on the prey fish base to fisheries managers and are used to facilitate understanding of long term population trends in the fish community. Data on prey fish populations are especially important in evaluating management strategies such as predator stocking and harvest quotas. The name, "Arcticus", is a nod to the rich legacy of her predecessor, the R/V Grayling. The Grayling was named for the Arctic Grayling, a fish native to the Great Lakes region, which has the scientific name, "Thymallus arcticus". The Arcticus can be at sea thirty days with sleeping accommodations for eight people. 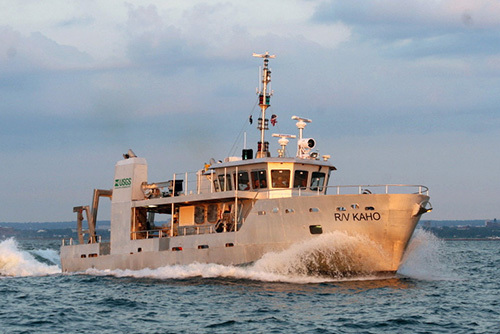 The R/V Kaho, based in Oswego, New York, was built in 2011 and currently operates on Lake Ontario. The new Kaho replaced the original R/V Kaho (built in 1961), which was the workhorse of the multiagency fisheries research fleet on Lake Ontario for more than three decades. The new Kaho participates in long-term data collections including population studies of prey fish and stocked lake trout, fish and environmental sampling for contaminants monitoring, and documentation of changes in food webs and fish distributions associated with invasive species. The name, "Kaho," is a shortened version of a colloquial Ojibwe word meaning "searcher" or "hunter". The Kaho can be at sea five days with sleeping accommodations for six people. The R/V Kiyi, based in Bayfield, Wisconsin, was built in 1999 and currently operates on Lake Superior. The Kiyi conducts fish stock assessment, fisheries research, and habitat monitoring, particularly in the Apostle Islands area of Lake Superior. The Kiyi annually samples prey fish populations and tracks progress in the sustainability of lake trout populations. The Kiyi is also used to collect fish and environmental samples for a wide spectrum of studies, including contaminant monitoring. The name, "Kiyi", honors the fish species of the same name, Kiyi, which is a type of freshwater whitefish—a deepwater cisco—endemic to the Great Lakes. Kiyi previously inhabited multiple Great Lakes, but are now believed to persist only in Lake Superior. The Kiyi can be at sea fourteen days with sleeping accommodations for nine people. The R/V Muskie, based in Sandusky, Ohio, was built in 2011 and currently operates on Lake Erie. The Muskie replaced the R/V Musky II, which was the primary USGS research platform on Lake Erie since 1960. The Muskie is used to assess annual recruitment of major prey and predator fish in western Lake Erie as well as in lake trout restoration research in eastern Lake Erie. The Muskie also participates in studies designed to determine the impacts of environmental changes and invasive species on the Lake Erie ecosystem. The name, "Muskie", was based on the names of her predecessors, the R/V Musky I and R/V Musky II, which reference the native Great Lakes sport fish, the Muskellunge. The Muskie can be at sea five days with sleeping accommodations for six people. 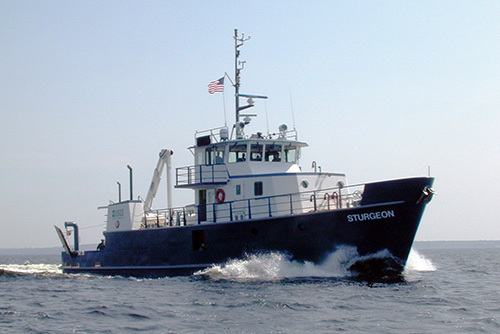 The R/V Sturgeon, based in Cheboygan, Michigan, was built in 1974 and currently operates on Lake Michigan and Lake Huron. The Sturgeon was transferred to the USGS Great Lakes Science Center in the 1990s and was later retrofitted and commissioned in 2004. The Sturgeon supports fisheries related science, including deepwater studies, restoration ecology, and invasive species assessment, to aid in management decisions for top predator fish. The name, "Sturgeon", derives from one of the most ancient native fish in the Great Lakes, the Lake Sturgeon. The Sturgeon can be at sea fifteen days with sleeping accommodations for ten people.